There are still parts of the Valle de Uco that resemble the semi-arid desert that existed here before vineyards and fruit trees blazed colour across the valley floor. 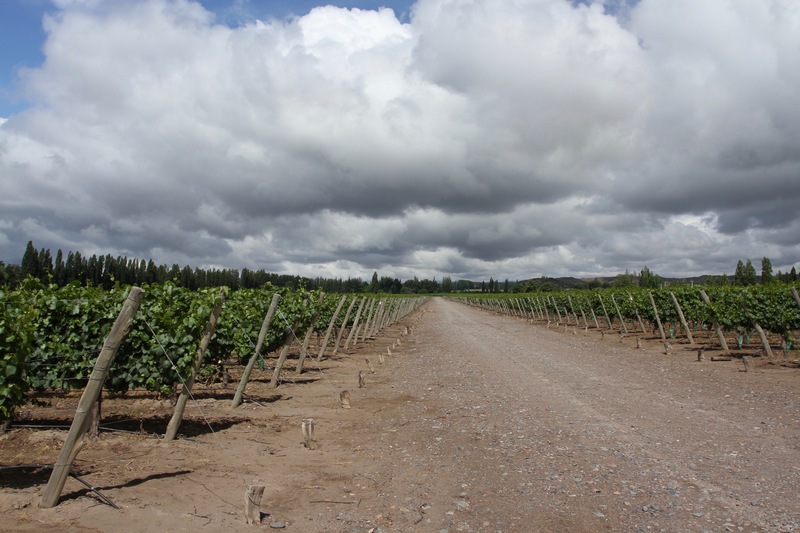 When you see the landscape as it once was, it’s hard to imagine how this area became famed for being one of the largest producers of exceptional wines in Argentina. It took visionary people to see in this scrubby landscape, a thousand or more metres above sea level, the perfect location for viticulture. 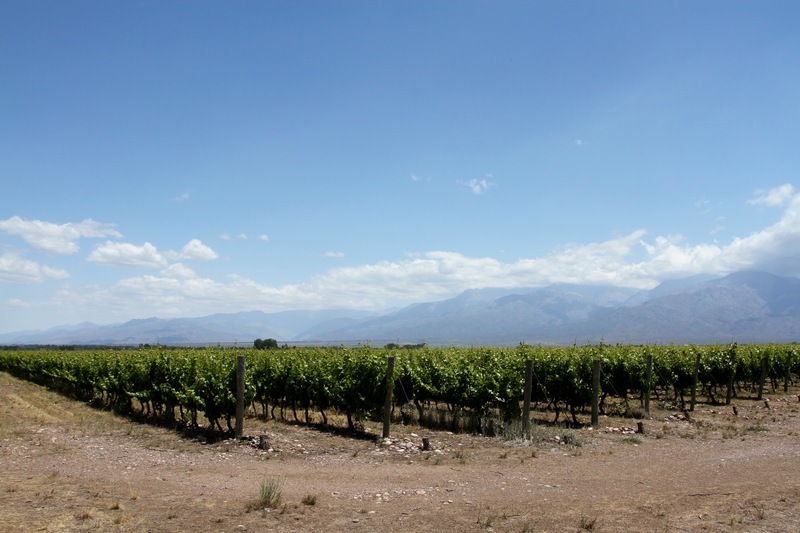 As unpromising as it looks at first glance, fed by snow melt from the Andes, the terroir of the Uco Valley is perfect for several grape varieties, most famously Malbec, and today produces some of the finest Argentine wines. 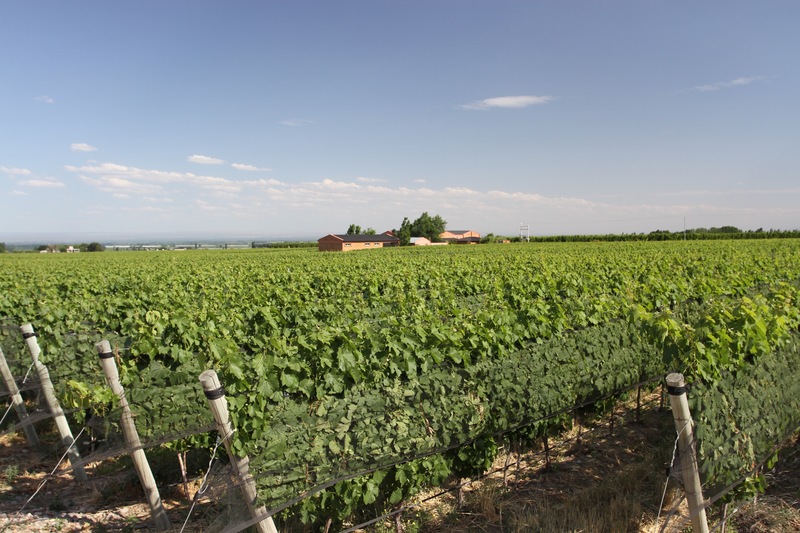 One of the first pioneers of Uco’s booming wine business is the Bodega Piedra Negra, named for the black stone soils that are typical of the area. Its owners, Jacques and Francois Lurton, arrived in the area from France in 1992 and brought with them a family winemaking tradition dating back to the 17th century. It was to here we headed for yet another wine tasting, in particular we were keen to sample their prestigious Malbec varieties, but also far less common wines like Pinot Gris. We hadn’t booked, but when we arrived the security guard called the colonial-style villa and arranged a guided tour. We were the only people there, and were shown around by Emma, a knowledgeable young French woman who had recently arrived in the valley to learn about the wine trade. We ended the tour with a tasting of several wines, and the purchase of several bottles more. 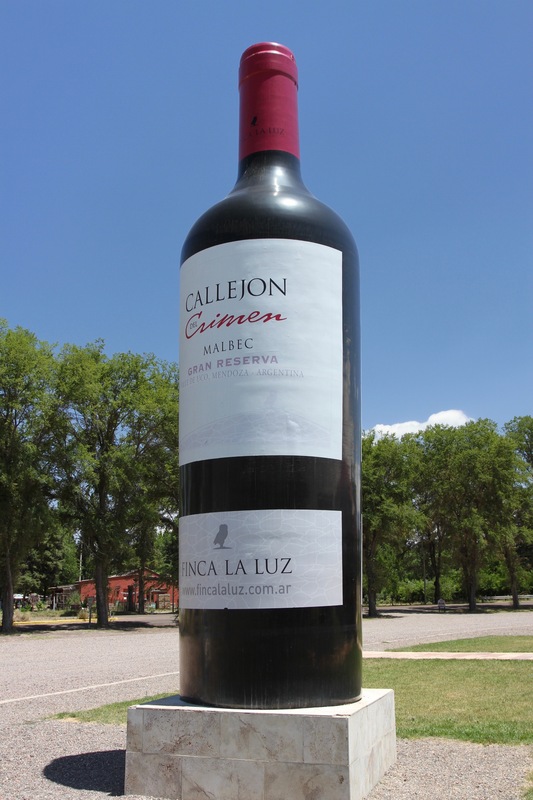 One of the unintended consequences of our visit to the Valle de Uco was buying more bottles of wine than we could reasonably hope to carry home in a suitcase, never mind lugging them around on the final leg of our trip to the Argentinian Lake District. Still, if you can’t make inadvisable purchases of wines while sipping them under an Andean sun in the middle of the vineyard where they’re produced, when can you? Adding to our earlier purchases from the previous day, the suspension of our tiny hire car looked under severe strain. On our way to Bodega Piedra Negra we’d passed through a strange place marked on the map as Manzano Historico, or Historic Apple Tree. This seemed a bit improbable, but in this dusty corner of the Valle de Uco is an apple tree that General San Martin is supposed to have sat under on his return from liberating Chile from the Spanish. 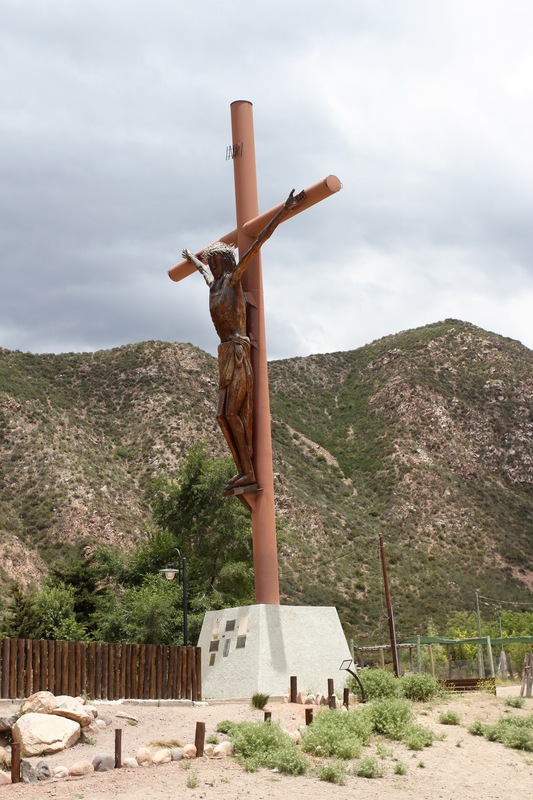 The alleged tree is still there, as is a big monument to San Martin and an unnecessarily large Christ statue. There was a big school party misbehaving to add extra surrealism to the scene. 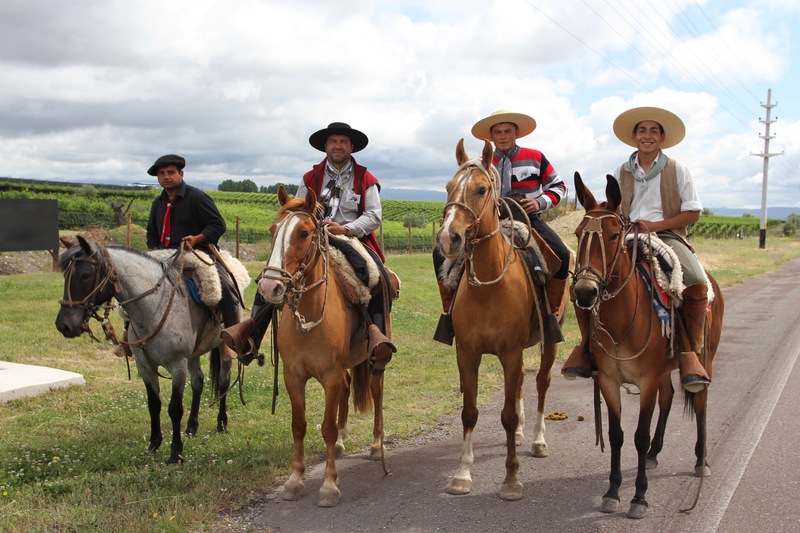 After our tasting we drove towards the small town of Vista Flores, passing numerous vineyards on the arrow-straight roads of the region. 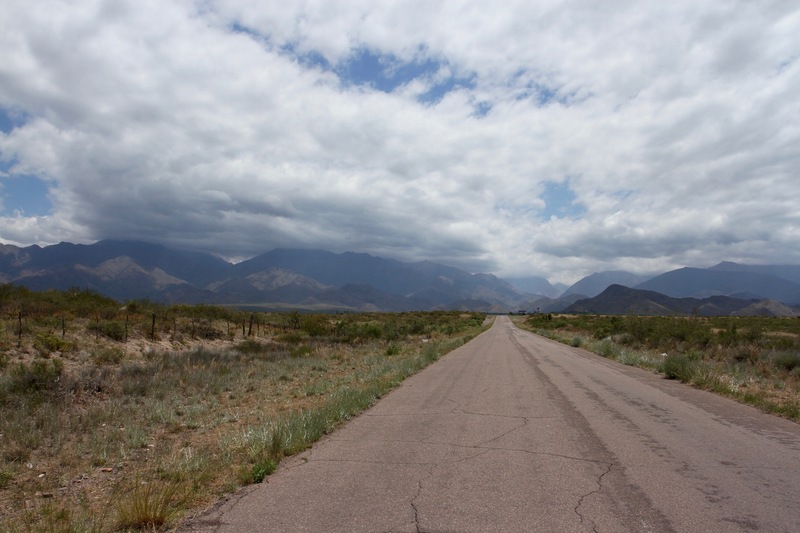 This is a vast place with huge skies, we saw very few cars and few signs of life, but did come across a man hitching a lift in the middle of nowhere. 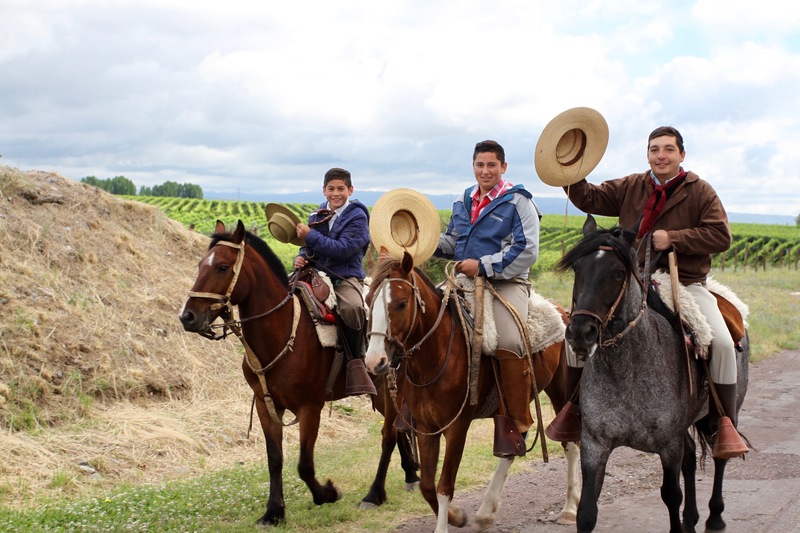 We gave him a lift to the town before deciding our time would be better spent by the pool at the Finca La Azul, where we were staying. This was our final night in the Valle de Uco and the chef had prepared a delicious farewell dinner, accompanied by a bottle of Malbec. 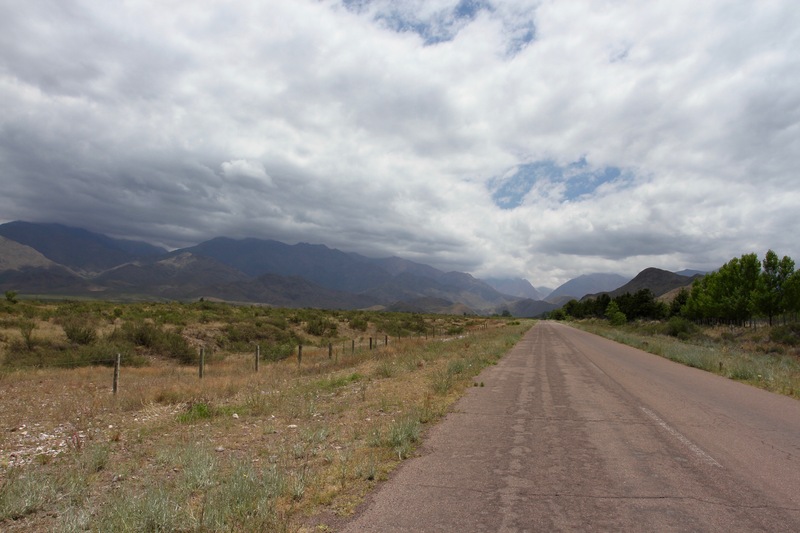 The next morning we packed our bags and bottles and set off for Mendoza airport, taking a route through the foothills of the Andes that would allow us to explore more of this magnificent region. 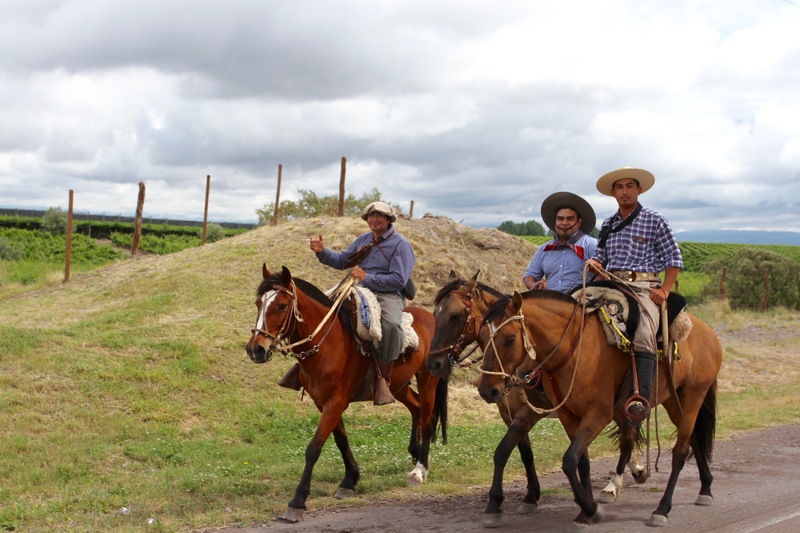 We hadn’t gone far when we came across gangs of gauchos riding in the opposite direction. We stopped to take a photo and they stopped to chat. There was a big fiesta happening in one of the bodegas further down the valley. 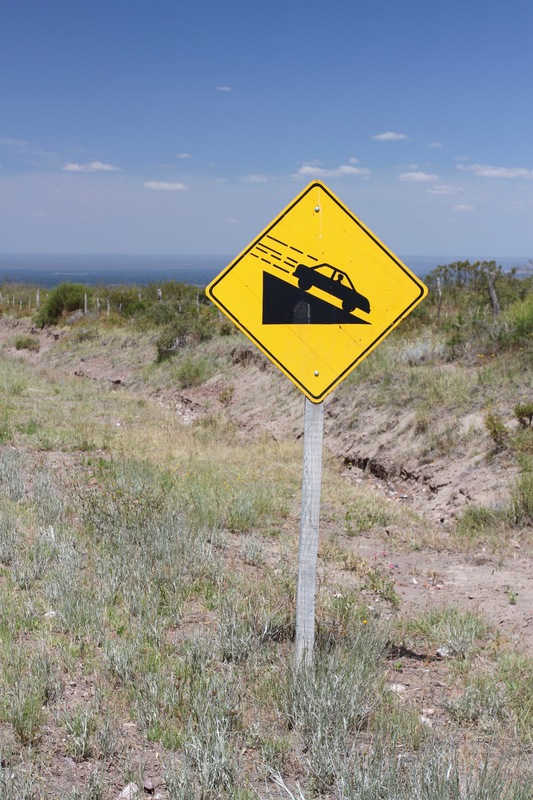 It was tempting to turn around and head towards the party … sadly common sense prevailed. It wouldn’t fit in the trunk of the car! And one of the nachos was astride a mule – great! I’m noticing a greater range of grape types over here also. 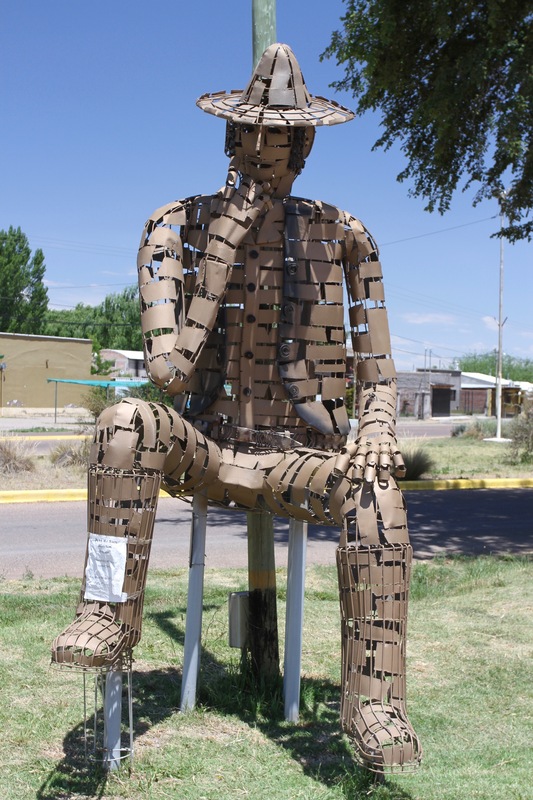 It’s a great sculpture, isn’t it! When I first saw it I thought it was made from corks. There’s a good variety of grapes, although Malbec is the dominant one. Luckily, it’s delicious.